Pull-Up Muscles - Which Muscles are used for Pull-Ups? Doing pull-ups can be very a very challenging exercise if you are starting out. However, it is great way to build up strength and muscle in your upper-body if the right techniques are applied. Furthermore, knowing witch muscle (groups) are stimulated when doing pull-ups is essential for making a choice when adding this particular exercise (or one of its many variations) to your regular training routine. 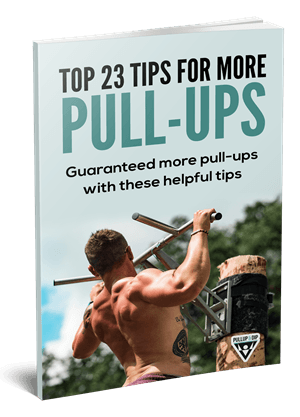 In this article we will be taking a closer look at the muscles used when doing pull-ups, how they work together and how variations of the pull-up exercise influence some muscles more than others. 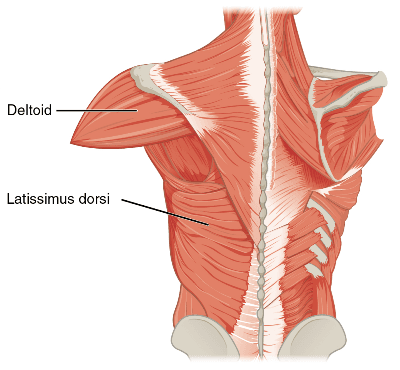 Latissimus Dorsi, also known as the lats muscle, is a flat muscle on your back that stretches out to the sides of the body. It resembles the shape of a triangle and is partly covered in the middle of your back by the trapezius muscle. One of the main roles your lats muscle plays is moving your upper arms closer to your body when doing pull-ups. 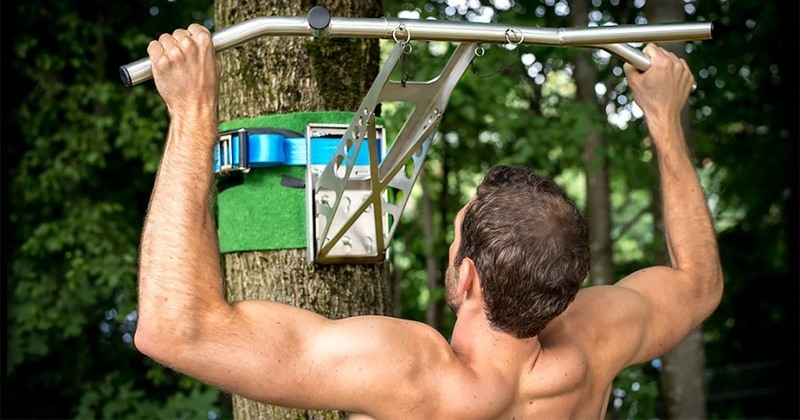 This can be considered as one of the main actions taken during a pull-up exercise which is essential for being able to pull yourself up on the pull-up bar. When doing a pull up, the lats muscle pulls on the upper arms, moving them closer the body. As a result, your body is able to rise up to the bar. If you are going to be doing pull-ups then you are choosing to work on your arms, which implies the usage of your biceps in order to do the exercise. Doing pull-ups greatly affects your biceps as it is the main muscle used for pulling yourself up on the bar. They work in conjunction with your lats muscles for example when you lower your body back down. Doing pull-ups alone may not be enough to do a thorough biceps workout but it is definitely a start. If you specifically want to train your biceps on the pull-up bar, we recommend you reading the following article "How to train biceps on the pull-up bar - 5 effective exercises"
When doing pull-up workouts you are also using your trapezius muscle. Building this muscle requires that one performs vertical ‘pulling’ movements that stimulate it. located in the middle of the upper back, the trapezius, along with your lats muscles, are the main muscles that take the load when doing pull-up exercises. While the pull-up exercise works a number of upper-body muscles, it also stimulates muscles in your back (e.g. depending on your grip). Using a wide grip on the bar would stimulate your deltoid muscles more for example, giving your shoulders a better workout. Using a neutral grip also works for your muscles as it places less strain on your joints whilst proving a workout for your deltoids. For more information about pull-up grips see our article "8 different grip positions for pull-ups". 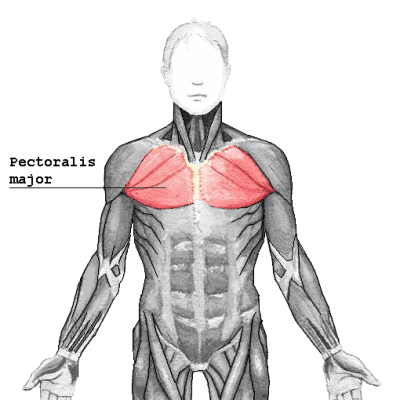 The pectoralis major, or commonly known as the pecs muscle, makes up the bulk of your chest muscles. It may not be obvious but your pecs muscle also plays a role in assisting your lats muscle when pulling up. Together with the coracobrachialis, which starts on the front of the shoulder joint and stretches out to the upper arm, it assists the lats in pulling your upper arms to the body. 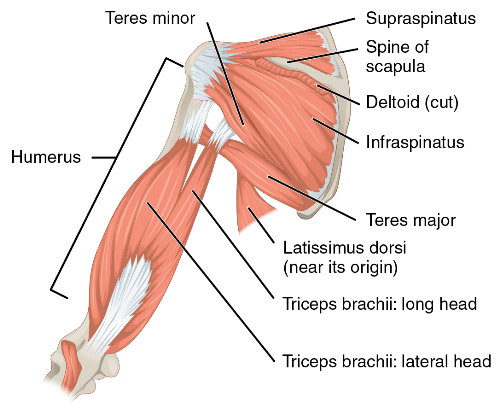 The teres major muscle is positioned above the latissimus dorsi muscle and attaches to the scapula as well as the humerus. The infraspinatus muscle on the other hand spans across the entire back of your shoulder blade and stretches out to the upper arms. 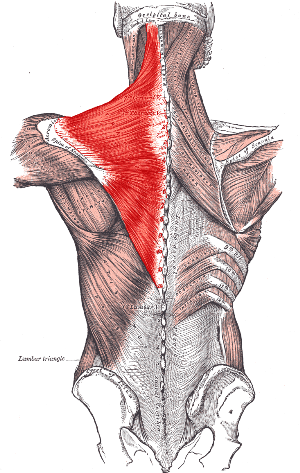 Beneath the infraspinatus you will then find the teres minor, which is on top of the teres major. Together, these three muscles also assist your lats when doing a pull-up. 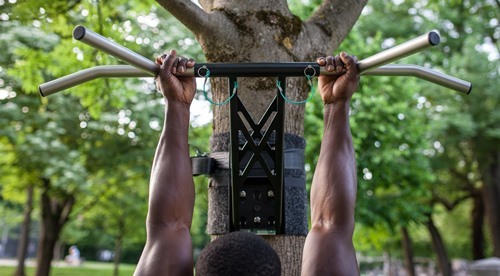 Now that you have a good idea of what muscles are involved when doing a pull-up, let us also look at several pull-up variations of the pull-up exercise along with some handgrips as these can influence (other) muscles more. Doing chin-ups on a pull-up bar causes you to stimulate your biceps muscles. In essence, they assist you in pulling your entire body up and lowering you back down slowly. This is one of the key differences compared to a regular pull-up where your biceps would help do some of the lifting instead. Unlike regular pull-ups, neutral grip pull-ups stimulate both your biceps and lats muscles. Using a neutral grip when doing a pull-up also causes you to use your biceps more when pulling your body up, compared to doing a chin-up. This is because the brachialis is also targeted. The brachialis is a deep muscle in the upper arm that flexes the elbow joint. Using a neutral grip also stimulates the muscles on your forearms, thus improving overall strength in this area as well. 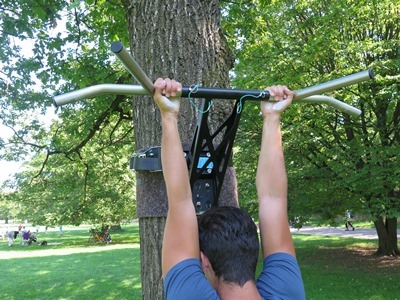 Our mobile pull-up and dip bar offers you 5 different grip positions and can be used indoors and outdoors. Doing a leg raise during a pull-up causes you to use all of your abdominal muscles as well your thigh muscles to hold the position as you pull your body up and lower it back down from the bar. In fact, doing leg raises works on all your core muscles, which can be very beneficial if you are looking to get more out of your training exercise. It is noteworthy to mention that there are some variations of doing a leg raise that will strengthen or focus on one particular muscle more. 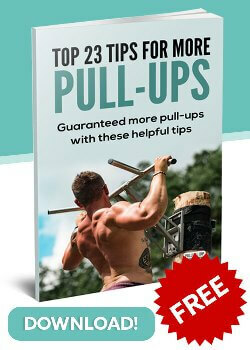 If you want to train your abs on the pull-up bar check out our article Best 10 Pull-Up Bar Exercises for Abs. A Muscle-up is a complex variation of the pull-up exercise which stimulates your arm muscles more, especially in the final stage of pushing your body up onto the bar. In addition to arms, muscle-ups also demand more from your chest and triceps muscles. Hence, it is an interesting variation for working on specific areas such as arms and/or chest. Muscle-ups can be best done with a straight pull-up bar. 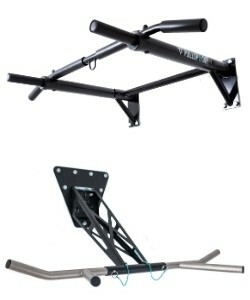 See all our pull-up and muscle-up bars! So there you have it! 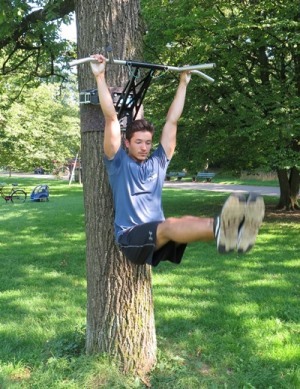 We have gone through the muscles that are worked on when doing pull-up exercises. As you have seen, certain variations of the pull-up exercise certainly influence different muscles more than others. This can relate to the exact position used or the chosen hand grip on the bar for example. If you are intending to build up muscles in certain areas only, e.g. arms or chest, then it may be wise to choose those variations that stimulate the right muscles such as muscle-ups. All of this can be vital information when putting a training routine together. Therefore, we hope the information presented in this article will be of use to you in terms of learning about the various muscles and choosing the right variations. Great informative article, thanks a lot! Some people say the lower back muscles are also trained a lot when doing pull-ups, do you agree with that? Btw: maybe you can also include the forearms in this article as in my opinion they are also trained a lot during pull-ups. The article gives me a lot of information. That's great! Very good explanation. That will definitely help me. Thank you for the detailed article.